The Iiyama GB2530HSU Black Hawk offers a decent gaming performance for budget builds that need a well-designed display that won’t break the bank. 75Hz isn’t a lot by today’s standards, but the extra headroom adds a distinct improvement to a display’s motion handling, especially in fast-paced titles. The Iiyama GB2530HSU Black Hawk has a lot of rivals in its price bracket, but it brings a few aspects to the table that makes it worth checking out. 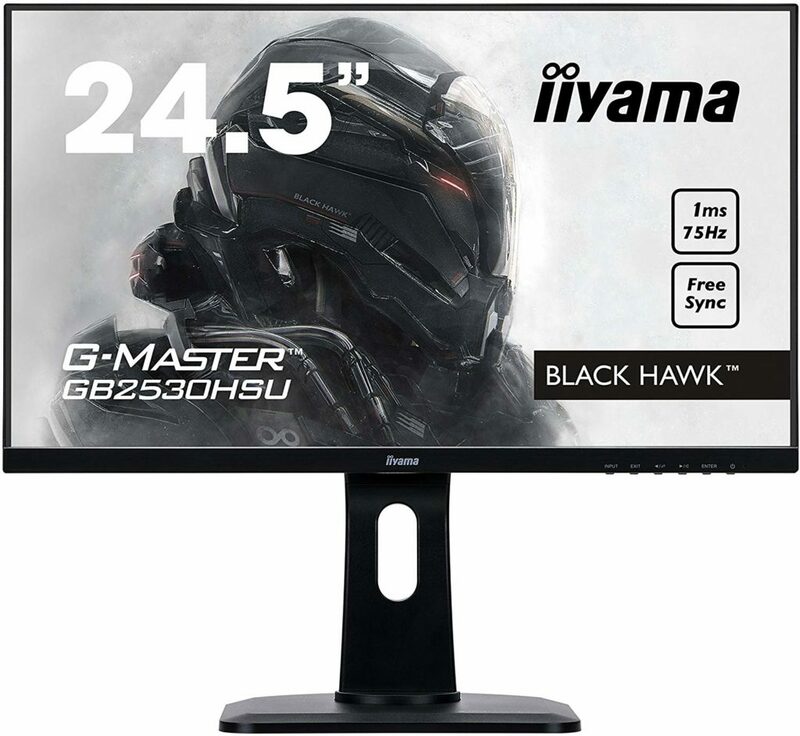 The Iiyama GB2530HSU Black Hawk sports one of the best-looking designs in its low priced segment. The monitor is finished in matte black with no bright streaks to indicate a gamer-centric orientation. What sets this model apart from its competitors is the noticeably slimmer bezels which give you a clearer view of the screen. The proportions of the Iiyama GB2530HSU Black Hawk is relatively sleek and the bulge at the back is flat. These characteristics make the monitor suitable for VESA mounting, although that isn’t necessary. We also noticed that the monitor is slightly heavier than its competitors, indicating that the build quality is solid and reliable. The Iiyama GB2530HSU Black Hawk ships disassembled, but you won’t need to exert a ton of effort to put it together. The cabinet attaches to the stand via screws which can be tightened with hands so tools are unnecessary as well. Take note that you do need to prop the display up on a desk and press the height adjustment lock to lower or raise the display. One of the best features of the Iiyama GB2530HSU Black Hawk is it comes with a full range of ergonomics, despite fitting into the entry-level bracket of the market. You can tilt, swivel, pivot, and adjust the height of the display according to your needs. This capability is crucial for TN monitors since it’s required to find the perfect angle to avoid color shift. One of the letdowns we found on the Iiyama GB2530HSU Black Hawk is its use of typical OSD buttons instead of a convenient joystick. This is expected due to the budget-oriented nature, but some of the variants from the brand already shifted to joystick controls. At least each of the buttons at the bottom is labeled nicely with sufficient spacing so as not to confuse the user. The Iiyama GB2530HSU Black Hawk is comparable to the Acer XF251Q we reviewed earlier, but we like the connectivity on this model better. You get DisplayPort 1.2, HDMI 1.4, and a VGA connector for video inputs, plus there are two USB 2.0 slots for accessories. DP 1.2 isn’t necessary for 1080p 75Hz operation, but it’s nice to have for modern cards that are ditching HDMI. There is also a pair of 2-Watt speakers which are great since competitors would gladly leave them out at this price. The bad news is that the set is underpowered for gaming or movies, and turning the volume up will only make the audio worse. 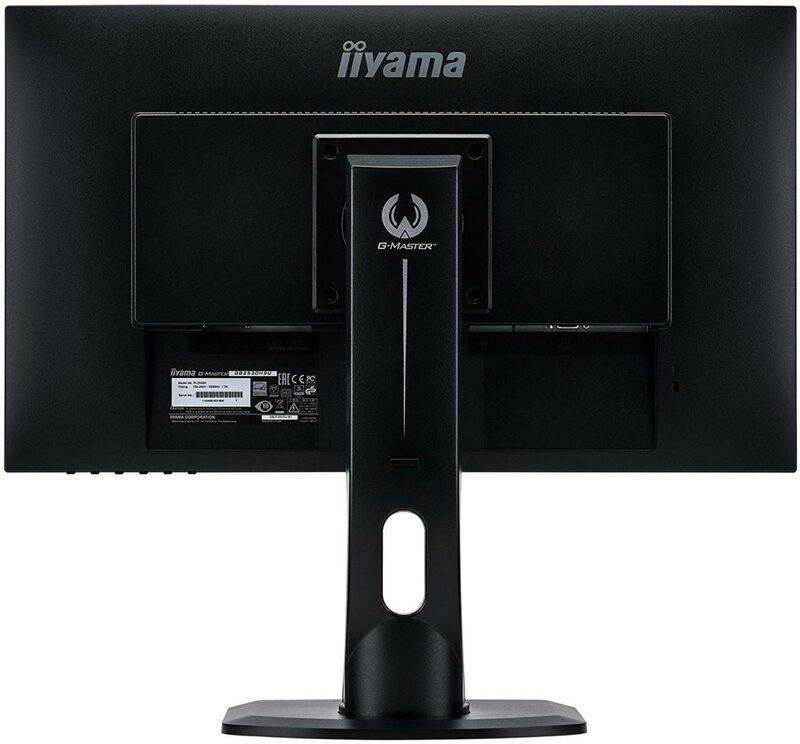 The Iiyama GB2530HSU Black Hawk sports a 25-Inch TN panel with a 1920 x 1080 resolution, 75Hz refresh rate, and 1ms response time. The screen also has a specified 1000:1 contrast ratio and is backed by a 250cd/m2 backlight. This combination of specs make the display perfect for playing MOBA or RTS titles which could benefit from the extra smoothness, but do not require 144Hz or above. The image quality of the Iiyama GB2530HSU Black Hawk out of the box is disappointing since the screen looks washed out. sRGB coverage only reaches 88% with a DeltaE average of 5.2. The screen is also overly bright which penalized the gamma to 1.9 and the contrast ratio to a dismal 300:1. However, these issues are pretty easy to fix to bring the Iiyama GB2530HSU Black Hawk up to standard. The monitor includes a Black Tuner setting that will boost the contrast to a respectable 850:1 when set to its number 2 level. You can also tweak the Color Saturation to around 8 which will bring the color output to 97% sRGB coverage with an average of DeltaE 2.9. Doing this together with lowering the brightness will fix the Iiyama GB2530HSU Black Hawk’s Gamma and set to to 2.1 to provide a more balanced picture. The blacks and grayscale will show more significance to define the images in games. The only error we couldn’t fix is the color temp which was set at around 6900K instead of being closer to the ideal 6500K. These imaging scores aren’t impressive, but it’s difficult to get professional-grade fidelity at this price range. Once these tweaks are in place, you get a pleasant looking screen that’s just as good as some of the 144Hz monitors we tested. The deviances will be difficult to notice for the untrained eye or unless you have a better display to compare it with. On a positive note, the Iiyama GB2530HSU Black Hawk does quite well when it comes to panel uniformity. Color deviances between the quadrants of the screen are kept to a minimum, so the screen looks balanced anywhere you look. The spread of the backlight for the device also keeps the differences below 10% which isn’t noticeable in daily use. The Iiyama GB2530HSU Black Hawk is also FreeSync compatible to let AMD GPU users enjoy buttery-smooth gaming. The functional range is only 48Hz to 75Hz, but it’s enough to cover where FPS fluctuations at this resolution will occur. Input lag averages at 15ms which isn’t the fastest, but we did not notice any delays or “desynced” situations during our testing. The Iiyama GB2530HSU Black Hawk is a decent monitor since you can easily fix its quirks with a few simple tweaks in the OSD. The monitor isn’t perfect when it comes to image quality, but you can consider these results fair for this category. After all, the monitor is value oriented and wanting something better will cost twice or thrice. The Iiyama GB2530HSU Black Hawk is suitable for budget builds or playing games such as MOBAs and RTS which do not require a higher refresh. The Acer XF251Q offers a slightly better screen, but the design on this model and its connectivity has more value.